BMW engines often receive acclaim on this site, but Audi's latest generation of performance engines, including the one in the S5, need to be considered in the same company — they're that good. 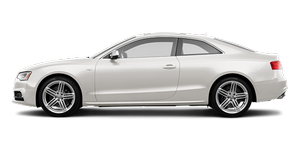 The S5's 4.2-liter V-8 kicks out 354 horsepower at 6,800 rpm and 325 pounds-feet of torque at 3,500 rpm. That's power you can appreciate every time you accelerate from a stoplight, and I often found myself running out of road as I traveled around Chicago and its suburbs. The V-8 doesn't care one bit if you decide to wind it out to its 7,000 rpm redline, either — it just emits a turbine-like whir as engine speed builds. It's this smooth-spinning nature that is one of the V-8's most endearing qualities. All this V-8-induced fun doesn't come without penalty at the pump; the S5's EPA-estimated gas mileage is 14/21 mpg city/highway, and the coupe is subject to a gas guzzler tax of $1,300 for its fuel-slurping ways. S5 buyers can have a six-speed manual or six-speed automatic transmission. The manual transmission's shifter slides smoothly between gears and engages with a slightly mechanical feel, but I found it more difficult than expected to creep along in heavy traffic in this car. The clutch and gas pedal are really touchy, and it's hard to get smooth engagement when starting off, which made my wife's head whip back and forth a few times. Even Audi's ultra-high-performance RS 4 sport sedan was more forgiving. Drive the S5 aggressively, though, and smooth shifts become easier. In a performance car, stopping with confidence is just as important as accelerating briskly. The S5's brakes felt up to the task; they're progressive and have good pedal feel.